Honey is a Rosh Hashanah tradition. The traditional dessert in Ashkenazie tradition is a honey sweetened cake called Lekach, also known affectionately as Jewish honey cake. We eat honey at Rosh Hashanah to taste our hopes for a sweet and good New Year. I wanted to create a healthier Pareve recipe for Jewish honey cake because the traditional version is heavy filled with dairy, eggs and oil. Many traditional pareve versions of this cake include margarine which we all know is not good for our bodies. For this recipe I’ve adapted a traditional honey cake recipe with healthy ingredients that are all plant based. This cake is satisfying without the unpleasant heaviness that comes from eating traditional cake. This cake have a similar taste profile to the french favorite pain d’épices and has the perfect level of sweetness. It tastes especially good when eaten with tea of coffee. This cake really is a modern update of a Jewish traditional food. This healthier version of this cake makes a lovely addition to your holiday meal. Raw Honey and spices give this cake a special earthy sweetness that everyone is sure to enjoy. 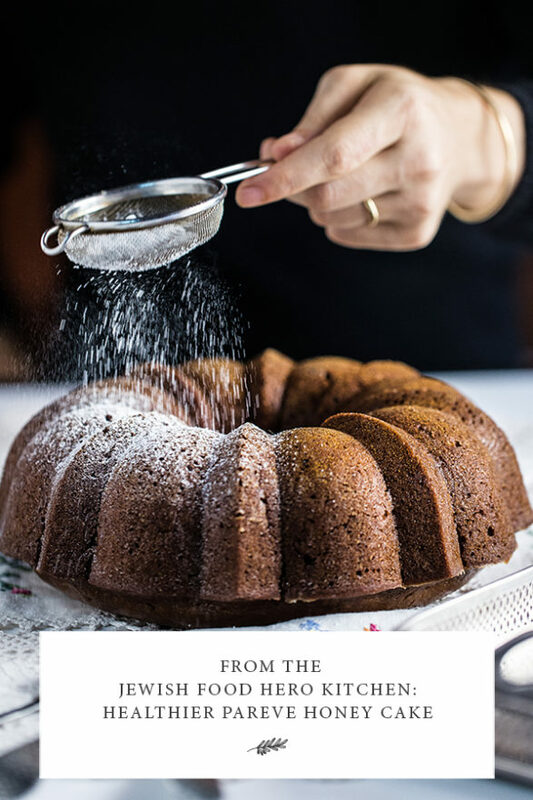 I used this bundt cake pan because it has non-stick finish so that the cake does not get stuck in the pan and retains its beautiful shape. Last Rosh Hashanah after I posted this recipe on the blog, a member of Jewish Food Hero’s Instagram community made this cake into muffins for her daughters class. Although it lends itself perfectly to Rosh Hashana, I make this recipe all year round. My daughter requested it for her birthday last year, and ever since all her friends ask me to make it whenever they come over to our house for a play date. If you make this cake and post it on Instagram or Facebook, please use the tag Jewish Food Hero so I can see your version of this cake. Pre-heat oven to 350 F (180 C). In a large bowl, combine the flour, baking powder, baking soda, sea salt and pumpkin pie spice. Whisk to blend. In a separate large bowl, combine the applesauce, non-dairy milk, honey and vanilla. Whisk to blend. Add the dry to the wet ingredients, add the currants and stir to combine. Don’t over mix. Lightly oil the bundt pan with earth balance. Pour the cake batter into the prepared baking pan. Bake in 350 F oven for 15 minutes. Reduce oven temperature to 325 and bake for 45 more minutes. Top should spring back to the touch when finished. Cool completely before inverting onto a plate. In a small saucepan, combine the honey with the cornstarch and whisk to remove any lumps. Bring to a simmer over medium heat while stirring constantly. Cook for a few minutes, until it thickens. Remove from the heat to cool. First dust the cake lightly with powdered sugar. Then evenly drizzle the cake with the honey glaze.